and I'm not terribly happy with it - what was I thinking, buying pink stripes? - but I am going to have to learn to love it. Anyway a warning. If you are making a blind and buy fibreglass rods which you have to cut to size, please do what the man in the shop told me, and wrap some tape round them where you need to cut. If you don't tiny, invisible bits of fibreglass come away and embed themselves in your fingers - if you've ever fallen foul of a cactus you will know what I mean. You can't see the little b*****s but you know they are there. I have been cheering myself up with these. They are lace-making patterns from an old factory and you can read more about them here. 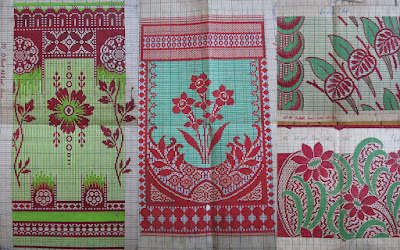 Aren't they beautiful, and wouldn't they make great cross-stitch patterns?